Zandra Rhodes is renowned for her romantic and lavishly embellished evening clothes. In The Observer (9 October 1977) she was described as 'the most original and fearless of British designers, admired for her dedication to doing what she feels'. This innovative creation was part of her Elizabethan Collection shown in Autumn/Winter 1981. The dress can be worn in two ways, with the under-panniers used as a support for the skirt (as in the image) or with the under-panniers removed and the bodice, which has a peplum (an extension), worn outside the skirt. 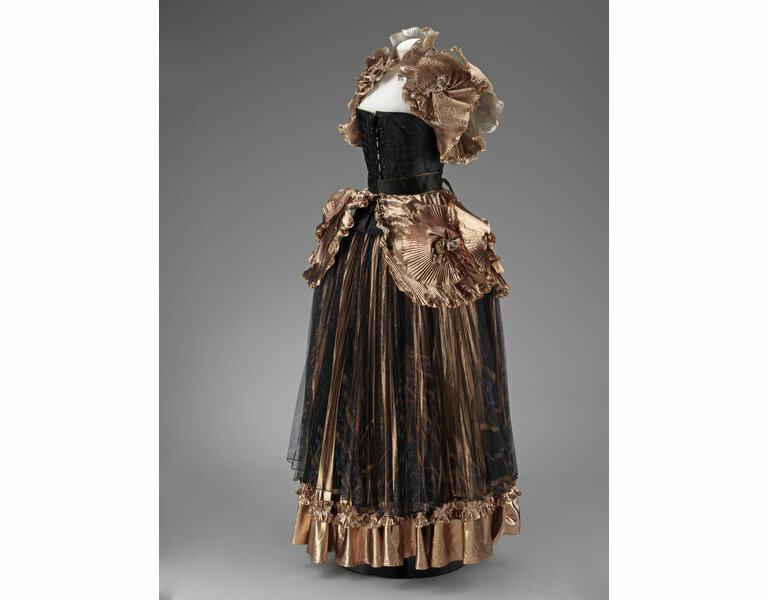 Zandra Rhodes studied 18th-century panniers in the V&A before completing this 'Renaissance crinoline'. 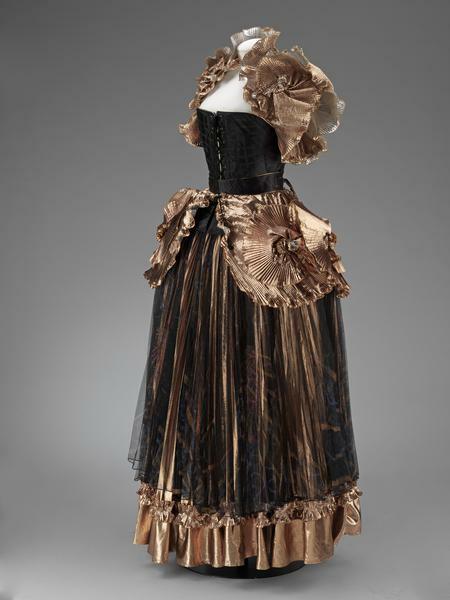 Evening dress consisting of a jacket, skirt, petticoat and apron. Black printed quilted satin bodice, gold pleated polyamide polyester and lamé skirt and paniers over black printed silk tulle. de la Haye, Amy, ed. The Cutting Edge: 50 Years of British Fashion 1947-1997. Victoria and Albert Publications, London, 1997, p. 82. Zandra Rhodes's 1981 Elizabethan collection was inspired by historic garments in the V&A. 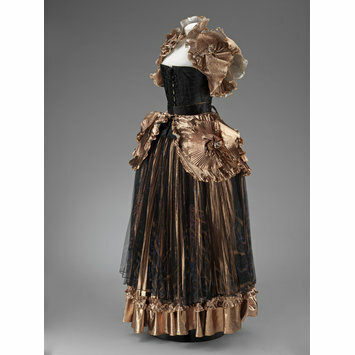 Her idea was to recreate panniers, lightweight petticoats with boning supports, to be worn under the voluminous dresses. Wearers could then forego layers of petticoats usually required to aschieve the full-skirted look.